All government jobs aspiring candidates here is news for you. Every year there is a huge requirement for government jobs. Even in 2019, there are a lot of upcoming government jobs. 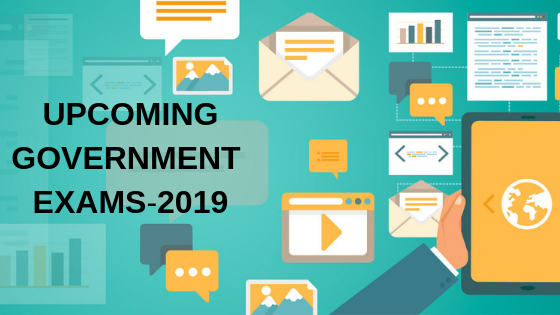 Here is the complete list of upcoming government exams in 2019 along with necessary details for each exam. LIC AAO 2019– The Life Insurance Corporation (LIC) of India is conducting a recruitment drive for Assistant Administrative Officer post. The LIC Recruitment 2019 Process has already begun and candidates who are willing to work in the top government Insurance company can start applying now. There are a total of 590 vacancies in LIC AAO Recruitment. DSSSB 2019– The Delhi Subordinate Services Selection Board is recruiting candidates for various posts under the department of NCT Govt., Delhi and its autonomous regions. The filling of applications will begin from January 2019. Candidates can refer the official website for more information and registration process. There 9232 positions vacant for teaching and non-teaching posts. BTET 2019– Bihar Teachers Eligibility Test is likely to be held in the month of July 2019. Candidates who wish to set up their career in the teaching field especially as a primary teacher in government/private/public schools of Bihar can apply by the end of April 2019. The test is conducted in two modes: online and offline mode. Candidates can prepare well for the exam by referring to online books. There are many sites offering online books. Candidates can either buy books online or can even download PDF format books. Haryana Police Recruitment 2019– Haryana police Recruitment is conducting the entrance exam for the vacancies of Sub Inspector and Constables post in 2019. There will be around 12000 vacancies for SI, ASI, and Constables this year. Candidates have an opportunity for making their career in Haryana Police and Serve the people of Haryana State. Visit the official website of Haryana Staff Selection Commission i.e. hssc.gov.in for more information regarding the exam registration process. RRB 2019– Railway Recruitment Board is conducting entrance exam for 245,000 vacancies in ALP, ASM, Goods Gaurd, NTPC and many more across India. Candidates willing to get into the railway sector then here is a great chance for all of you. The Board will be releasing the dates and other information on their official website. UPSC– The Union Public Service Commission is India’s central recruiting agency responsible for conducting examinations for Group A and Group B central services. UPSC 2019 is conducting entrance exam for many fields of the career which includes IAS, Engineering Service exam 2019, CDS examination, CISF AC(EXE)LDCE 2019, NDA & NA 2019, Civil services prelims 2019, ISS & IES, Indian Forest Service, Geologist & Geoscientist, Central Armed Police Services. Candidates can get the information on all exam and registration details from the official site of UPSC. Buy IAS Preparation Books to prepare for the exam. It is not just enough applying for government exams but it is equally important for any candidate to clear these competitive exams. One has to prepare well for cracking government exams. There are millions of candidates applying for one single position. Hence, one can study well through online books available. These online books not only have printed information but provides interactive sessions which will help any student to understand concepts easier. Digital books include images, videos, graphs, charts which will be more interesting to study for any topic. There are many sites offering competitive exam books and even mock tests to check your ability in the subject. GATE Normalization Process | How GATE Score is Calculated ?